Here’s an informational layout for a placemark. You’ll notice the window is more narrow than the previous layouts. It contains formatting for several paragraphs, one with a hyperlink, and a closing hyperlink. In this case I’ve used Blogger to do the work for me. I typed and formatted several paragraphs in the “Compose” option in Blogger, including text color and size, and added hyperlinks also. Then I selected the “Edit in HTML” option, copied the HTML code (in orange below), and pasted it in a Google Earth placemark. The only changes I made to the Blogger code was to add line breaks <br> at the end of paragraphs to increase spacing. The only original HTML work needed was to set the background frame and color. Overall, I think it turned out well. 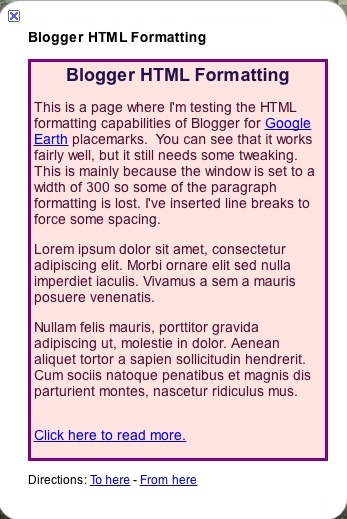 Blogger, or other HTML editors, could prove to be any easy way for you to format your paragraphs in HTML, although images will require additional code. Give it a try.